The Charleston is an oval bathtub embedded into a rectangle. It’s roomy enough for two adults to bath in comfort and style. Certain Charleston models have a center drain, so you can rest on either end comfortably. 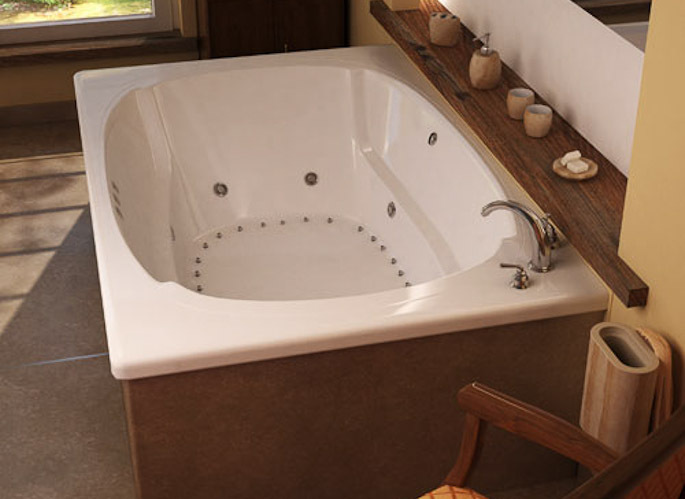 The Charleston is available as a soaking tub, air tub, whirlpool tub, or air/whirlpool combination. Call 800-720-1062 for more details. Winter Sale! Get a Free Inline Heater, Chromatherapy Lighting, and Premium Trim Upgrade on all Atlantis Whirlpool Tubs. Save Over $900! Hurry, Sale Ends Sunday!. 77.88" x 47.5" x 23"
Atlantis Whirlpools is one of the fastest growing whirlpool tub manufactures in North America. Part of the renowned Spa World family, Atlantis whirlpools main production plant is located in Miami, Florida. Atlantis Whirlpools expertise and knowledge in the production of high quality whirlpool tubs is unmatched. Atlantis has a dedicated and educated design and engineering staff and their extensive line of whirlpool bathtubs is sure to provide you plenty of options to help create the bathroom of your dreams.